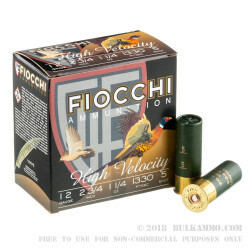 Fiocchi sporting shotgun shells are an incredible value. 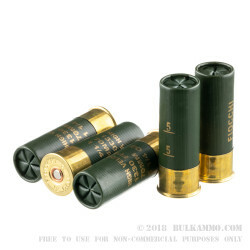 A clean burning, easy to shoot shell, this #5 shot is a perfect for pheasant, grouse, small game and could be used in a bind, for Turkey, assuming the right conditions. 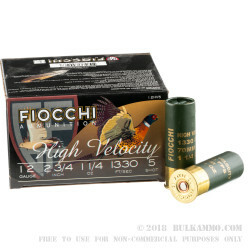 Given that it’s a 2 ¾” shell, turkey would need to be in close range for the most effective shots, but that shouldn’t discount this load: a high velocity (1330 feet per second at the bore) 1 ¼ ounce cup that puts a good pattern of #5 shot on target, this is a potent “standard” shell. A very versatile load, the #5 shell is a clear winner for the wide range of uses it has. It could conceivably be used in a home defense setting, as a much harder hitting load than a 7 or 8 shot, without the over penetration concerns you find with something as robust as a buckshot. As a game load, this is a genuinely useful bird load (where lead is permitted) and also doubles as a close range small predator load (coyote etc.) and for very small game. Brush birds and ground birds like quail and chucker, pheasant, etc. would be a good fit for this round also. This is a suitable round for use in 12 gauge 2 ¾” firearms.